This article first appeared in Personal Wealth, The Edge Malaysia Weekly, on July 9, 2018 - July 15, 2018. When she was in school, Aida Mastura Mohamed Idris took up the saxophone. It was an unusual choice of musical instrument for a girl, but she loved the sound it created. “I heard someone playing Widuri on it and I was hooked,” she says. 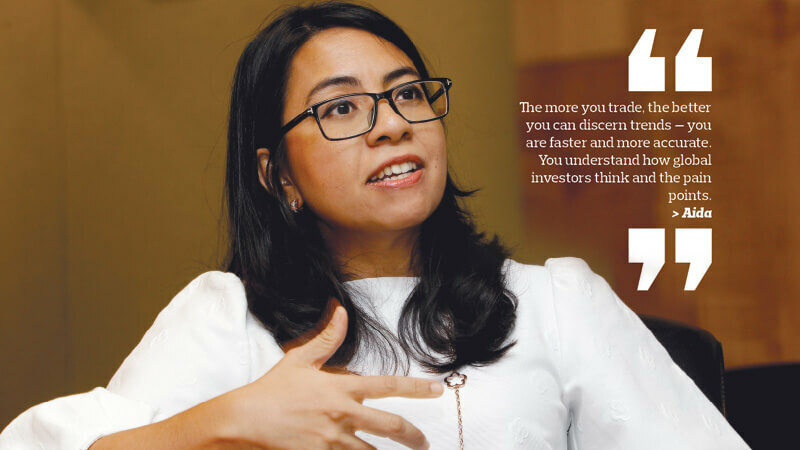 These days, as managing director of markets and securities services at Citi Malaysia, Aida plays to a different gallery — her “audience” being largely the clientele of the bank. What makes her tick? In a heartbeat, she says, “Market rhythms, its wavelengths and frequencies.” In fact, Aida says nothing gets her adrenaline pumping faster than when she is in a trading room — the more the volatility, the greater the excitement. Like the musical instrument she chose, Aida is in a segment of the banking sector that is usually seen as a man’s domain. She is one of only a handful of women bankers in the country who head the markets division. At Citi, Aida cut her teeth on foreign exchange (FX) trading, which is not only one of the toughest markets to be in but also a male-dominated one. She managed the local and foreign currency positions and forward swaps while supporting sharp pricing for corporate clients. She was also responsible for individual P&L and limits via risk-taking positions in FX spot markets for the ringgit, yen, pound sterling and other G10 currencies. Aida rose through the ranks very quickly to land the role she holds today. She currently oversees three key areas at Citi — markets, custody and equities. Aida joined Citi in 1994, at the tail end of the super bull run. Three years later, the Asian financial crisis hit. It was the highlight of her career — trading in the thick of the crisis. “That kind of experience was invaluable and I have not experienced it again. I was lucky to be at the right bank. It had the ability and the people — strong leadership that helped to ride out the crisis,” she says. Aida did not embark on a banking career out of any burning ambition. It was, as she puts it, expediency. Her first job was in data analytics. To get to work, she had to take two buses. Often, she had to wait two hours for a bus. Two weeks into her new job, while she was waiting by the road for a bus, she was caught in a downpour. So, when she was offered a job at Citi, which was near her sister’s office, she jumped at it. The days of waiting for buses were over as she could get a ride with her older sibling. At Citi, Aida stayed and stayed. She had found her calling. It has been 24 years and she still enjoys every adrenaline-pumping moment. “Citi allows you to do a lot of things. It is up to your own initiative. It is like being in university — every day is a new day, you learn new things and the bank has the resources to let you learn and get paid for it. All you need to do is perform and deliver,” she says. And deliver she did. The first year she took the helm, she grew the business by 27% — a creditable performance by any yardstick. It has been challenging as the needs of the market segments vary, which is why she stresses the need to learn, innovate and be ahead of the curve all the time. In FX trading, for example, one needs to know what drives the markets and this changes all the time, never a constant, says Aida. When she started out as a forex trader, things were pretty straightforward: she needed to understand monetary policy, economic fundamentals and, to some extent, technical matters. Understanding the fundamentals and technical stuff made up 60% to 70% of what one needed to know back then, she says. But today, investors have a global mindset. “Before the Asian financial crisis, foreign investors would look at Asia as a bloc. Now, the drivers of each Asian country are different. There are some commonalities, but the drivers of Malaysia, Indonesia, Thailand and Singapore are different. This means we need to do a lot more work to understand the different countries. If you want to invest in a country, you need to make informed decisions,” says Aida. Running three units is tough, but having a bunch of talented people on your team makes it easier. On top of that, keeping a finger on the pulse of the market helps. “I talk to my traders and dealers very often and I sit in the dealing room whenever I can,” says Aida. When the markets are hit by turbulence, Aida does not want to do anything but watch the tickers and Bloomberg screen. “It is like adrenaline straight through the veins,” she says. Having survived at least three financial upheavals in the last 24 years, Aida knows how the markets work and how to avoid the pitfalls. She says individual investors must have a good understanding of their risk appetite and have a take-profit/cut-loss strategy. As a global investor, knowing who the main players in the market are is helpful. “You have to stay alert and watch what these people are doing. When funds move, they move in herds,” she says. Learning from mistakes is important. “If you have not been burnt before, you would not know the pain,” says Aida. She did not survive 24 years in an industry that requires guts, discipline and 24/7 vigilance without getting burnt. Her first trading loss, when she was still a junior trader, was the most traumatic. She lost RM100,000 in a single day. “For a newbie, just 25 years old, I thought the world had ended for me. I could not eat or sleep. Did I make the wrong call? I was not disciplined, I was overconfident and I did not see the downside. But I learnt the painful lesson of the importance of a cut-loss and take-profit strategy,” says Aida. Having such a strategy alone is not enough. “We need to keep reassessing these cut-loss/take-profit levels and be disciplined about it,” she says. In trading, experience matters. “The more you trade, the better you can discern trends — you are faster and more accurate. You understand how global investors think and the pain points,” she says. It is very important for individual investors to understand their risk appetite so that they do not lose more than what they can afford if an investment turns bad, she adds. And this is where getting burnt teaches you lessons. The changing demographics and technological advancements are causing a huge shift in the wealth management industry. For one, a product base business model no longer works. Aida believes products are one thing, but delivery and sustainability are another. Many investors have become so much more sophisticated today, understanding things like the need for portfolio diversification. “It is about taking a holistic approach, being client-centric. The [banking] culture has been enhanced so that every part of the bank — operations, finance or compliance — are aligned with the Citi franchise and deliver the best products and experience,” says Aida. During her tenure at Citi, Aida has seen first hand the many changes in the banking industry and has kept abreast of developments to stay ahead of the curve. Prior to her current role, she was head of the investor sales team in Malaysia, covering institutional accounts here and in Brunei. She was also responsible for a team that focused on offering and delivering investment solutions to institutional investors. Aida helped transform the business from being bond-flow dependent to a multi-product sales team with the ability to cross-sell across bonds, FX, derivatives, credits, structured products and Islamic products. In her three years as head of investor sales, she grew the team revenue by 55%. Before heading the investor sales desk, Aida played a key role in product innovation and diversified Citi’s onshore investor product suite to include local and global credits as well as Islamic, hybrid and other structured products. Personal Wealth: Markets in the region, not just Malaysia, have taken a beating of late, post the 14th general election. Do you see more turbulence ahead or buying opportunities coming up? Aida Mastura Mohamed Idris: I am still constructive on Malaysia. Investors typically do not like uncertainty, but some prices have become attractive from a historical point of view. Some stocks have been hammered but fundamentally, they have not changed materially. So, this is an opportunity to buy. It is a matter of assessing the right entry level. I do think we see close to good levels for entry. Given that Malaysia is an open economy, our price actions are also affected by global themes. The rhetoric on a potential ‘trade war’ continues to unsettle markets in general. And so while we have seen volatility in the equity markets, we have also seen support coming in at various levels. This bodes well for the country and is a testament to how resilient the local economy is. You must understand that a new government is a huge uncertainty in any market. It will take time for investors to fully appreciate any new regime. It has been barely two months. Once the main concerns of investors have been addressed (such as fiscal reforms and the renegotiation of mega-projects) people’s narrative will revert to the fundamentals. I am confident about the fundamentals. Malaysia’s growth is above 5% and the 10-year average is above 4%, alongside moderate inflation. As a markets person, do you sense a different energy? Definitely a sense of palpable hopefulness. The people in the street, traders ... they are cautiously confident and that is encouraging. We saw volatility in the last couple of weeks. But going back to basics, nothing has changed. Going forward, what are the key challenges for markets and investors? In the bond market, one of the things we have to be prepared for is higher interest rates globally. The US is on a rate hike trajectory and we need to keep abreast of how fast this rate rise will be. It is a driver of how the bond market will perform. At the same time, while we understand how robust the fundamentals are, we need to be aware that we still have a large number of foreign investors in the market. If we do things right and we see the right announcements, it may not be as fast as investors want. But then again, investors are impatient. There are still uncertainties in the Malaysian market, coupled with geopolitical issues and an impending trade war. All these play a part in how the local markets move. The equity market has seen some industry rotation. Whether or not that is over, is not clear. These are some of the risks going forward. I think there is scope to expect investor confidence in the Malaysian market to remain intact, barring any unforeseen surprises.